The Musician's Guide to Theory and Analysis 2 Edition Theoretically current and pedagogically innovative, the Musician’s Guide series uses the phrase model approach to show students how music works in context. With a focus on real music literature that students know and play, it shows how music theory relates directly to practice and performance. 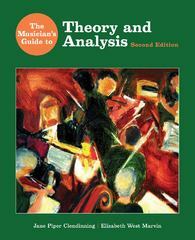 The Musician’s Guide to Theory and Analysis includes all topics essential to first- and second-year theory for music majors, from fundamentals to post-tonal theory and analysis.